Lakota Language Consortium What is Language Loss? Language is the life blood of culture. With every language lost, we lose a people's unique viewpoint on the world. Khéya Wíta ikčé wičháša tĥaíyapi kiŋ waníl áye. Hékta waníyetu opáwiŋğe tópa hetáŋhaŋ ikčé wičháša na tĥaíyapi kiŋ hená áwičakĥehaŋ atákuni šni áyapi. Eháŋni theĥíya wóakhipĥa kiŋ čhiŋkéšniyaŋ oyákapi, éyaš iyápi kiŋ tókhel šilwáakhipĥa héči hé Mílahaŋska oyáte kiŋ óta slolyápi šni. Aléčhalake s'e iyápi kiŋ hená líla theĥíyela ĥči úŋ. Wašíču kiŋ hípi šni haŋni léčhiya iyápi opáwiŋğe tóna yukĥéya úŋpi na waŋná toná napógna luhá oyákihi iyéčhel čónala tĥokátakiya ní kte okíhiphiča. Native languages are important for the same reasons language is important to any group. It is a fundamental human right of expression - a right that arises out of thousands of years of linguistic cultivation, wherein each generation carefully passes on its language to the next. In so doing, it passes on the culture as articulated in things like prayers, stories, songs, values, sayings, proverbs, and metaphors to each subsequent generation. Thus, each nation uses language to embed ideas of culture, history, philosophy and belief. Language is ultimately the core expression of a people's existence. Native languages are all linguistically and semantically unique. A great many ideas can only be accurately expressed in one language and not another, and this is very much the case with Lakota. 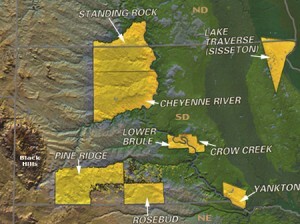 North and South Dakota today. Tókhel oyáte keč'éyaš tĥaíyapi waŋkátuya glawápi kiŋ héčhel Ikčé wičháša nakúŋ tĥaíyapi kiŋ hená waŋkál gluhápi. Hé ečhákel wóiyowaža tĥáwapi, waníyetu kĥoktópawiŋğe óta heháŋyaŋ iyápi kiŋ ičháĥ aú na iglúwaštešte aú, na wičhóičhağe iyóhila íyokhiheya úpi kiŋ hená iyápi kiŋ wičhák'upi. Héčhuŋpi s'e wičhóuŋ na wičhóĥ'aŋ kiŋ nakúŋ wičhák'upi. Wóčhekiye, wičhóoyake, ohúŋkakaŋ, olówaŋ, wóopĥe, wóeye na wóiyačhiŋ wičhák'upi. Héčhetu čha oyáte iyóhila tĥaíyapi wóilagye. Na iyápi kiŋ mahél wičhóĥ'aŋ, wičhóuŋ, eháŋni wičhóoyake, wóksape na wówičala hená oyás'iŋ yukĥé. Héčhel oyáte waŋ tĥaíyapi kiŋ hé tĥóuŋ héčha.Ikčé oyáte tĥaíyapi kiŋ íčhitĥoktĥokeča. Líla wóiyukčaŋ óta iyápi waŋ él eyá-phiča, éyaš tĥókeča okíhi-phiča šni. Na Lakĥótiyapi kiŋ nakúŋ héčhetu weló. Lakĥótiyapi na wašíčuyapi kiŋ líla íčhitĥokeča, ičhíŋ Lakĥótiyapi kiŋ eháŋni wičhóuŋ él aíkĥoyagye. Wičhóuŋ kiŋ héhaŋ oyáte kiŋ thiyóšpaye-tĥuŋtĥuŋyaŋ úŋpi, makĥá ikčéya úŋpi, théhaŋyaŋ iglákapi na áwičakĥeya táku wakĥáŋ ohólapi na wačhékiyapi. Human diversity is measured, in part, by the languages we speak. Language is the keystone of cultural and tribal recognition and commonality. Each language expresses a mindset that is, in the end, unique to the community that speaks it. The number of different languages spoken across the world has been in steady decline since 1950. Despite modern advances in many domains, our world is shrinking in the area of linguistic and cultural variety and distinction. Of the more that 6,000 languages spoken across the planet, over 43% are considered endangered and more than half of all languages will become extinct in the next 100 years at current rates. UNESCO measures language vitality in six measures of health: Safe; Vulnerable; Definitely Endangered; Severely Endangered; Critically Endangered; and Extinct. Currently 577 languages are Critically Endangered- on the verge of extinction. After global warming, language loss is the Earth’s most acute crisis. Visit our sister site, The Language Conservancy, to learn more about this world wide crisis. 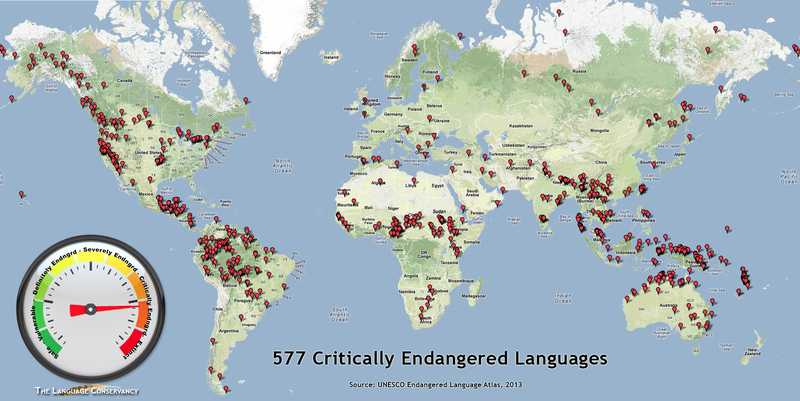 The 2013 UNESCO map of endangered languages.